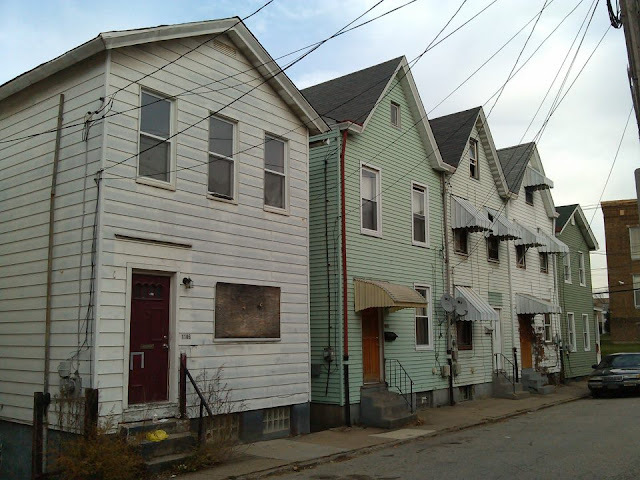 These houses, located on Church Avenue in McKees Rocks, have a fascinating history! In 1908, the Pittsburgh Press reported that "pretty" 17 year-old Nelly Yost, a singer, had been murdered by her older admirer and next door neighbor, Samuel L. Gardner. Gardner was a former McKees Rocks borough engineer, 56 years-old, and married! They lived side by side in the two houses to the left in the picture. Nelly Yost was shot three times by Gardner before he shot himself (both died) at the foot of the stairs in the house second from left. This is a fascinating bit of information. I grew up on this block and my family's history on Church Avenue goes back to 1890, but I don't ever recall hearing this story. Can you tell me which issue of the Pgh Press this was published in 1908? I'm an avid amateur genealogist and the history of McKees Rocks looms large in my research. It is so wonderful to see the interest you have taken in historic preservation. I appreciate all of the photos, etc. you have posted and will come back to your site often in future, I'm sure. I don't remember which issue off the top of my head, but I found it on Google news "archive," which has a bunch of old articles about McKees Rocks. Thanks for your comment!